Turbans differ from their close relatives, the Top or Trochus Snails, in having their trap door (operculum) heavily calcified to form a so-called ‘cat’s eye’. The Military Turban is one of the larger species of its family (Turbinidae), growing to approximately 100mm in shell length and is frequently seen subtidally by divers, sometimes sporting encrusting worm tubes or algal growths. 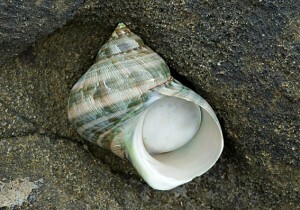 Shells of the Military Turban or its cat’s eye operculum are often cast ashore after rough weather. Some specimens may feature short spines – possibly an indication of sexual dimorphism. Cat’s eyes of other species of Turban shell are coloured differently or may have elaborate sculpture and hence are useful for identifying species. Indigenous: Eastern Australia (possibly restricted to coast from Southern Queensland to Sydney, New South Wales).